Rabbi Daniel Sturgess was born and raised in Essex, and graduated with a BSc in Mathematics and European Study (Spanish) from University of Exeter. Following graduation he spent more than six years studying in the Aish HaTorah and Mir yeshivot in Israel, receiving his Semicha and graduating from the Ner LeElef Outreach Training Programme. 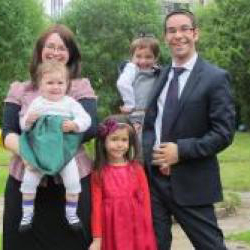 For the past four years he has been the Rabbi and Director for Aish in Birmingham; running educational and social programmes and providing pastoral care for the Jewish students at the Birmingham universities. He has created and delivered Rosh Hashanah and Yom Kippur explanatory services for the United Synagogue over the past 10 years and recently organised a highly successful Birmingham Community Poland Trip. Other employment history includes work as an actuary for the Prudential and as an analyst for IDT Europe.